The white-stone Church, the pre-existing Cathedral, in 1844 came in emergency condition298 (or even hit299). In 1849, the Cathedral was rebuilt out of brick with an almost literal reproduction of old forms. To have survived a copy of a drawing made before the disaster that befell the temple300 (Fig. 49). Fig. 48. Staro-Nikolsky Cathedral in Mozhaisk. General view. Since we are talking about early Moscow architecture, it would be more correct to call Staro-Nikolsky Cathedral of St. Nicholas Church: the Church is in the middle of Mozhaisk fortress, and at erection, rather, he had the status of a city parish Church. St. Nicholas Church is referred to as the "Cathedral", but since XVI century301. The drawing of the first half of the XIX century (Fig. 49) shows look apses of the temple, set at a very high basement. The pillars are thin, square section. Above sailing ring introduced conical part, above the medulla is (as if bunk) the pedestal, on which stands a small, but high vosmiokonny drum. 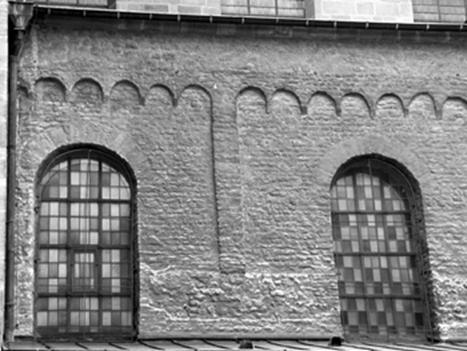 The facade surrounded by wide'ornePro shoulder to say anything definite is extremely difficult, as the image of the facade and on the terms they are reproduced in different ways and in the latter case, more like pilasters. The system of codes is also depicted very strange (N.N. Voronin even believed that the branches of the cross were covered by cross vaults vsparushennoy configuration302). No documentary evidence of the date of construction of St. Nicholas Church we do not. AI Nekrasov, dated the Church by the end of the XV century - the time of stay in Mozhaisk Prince Andrew Uglich. This conclusion was made on the grounds that Prince Andrew was a "lover, among other things, architecture and the Creator of Uglich Palace"303. The researcher also conducted a parallel between Mozhaisk and Volokolamskoye cathedrals. "It is plausible to assume that it is the first Mozhaisk Prince Andrew of his capital city was to acquire a stone temple... the Temple was very close to Zvenigorod cathedrals Yuri Dmitrievich"304. Voronin also attracted data on Colorcoi icon found at the beginning of the XV century (one of valves which was the image of the prophet Elijah), linking with the same time the chapel of Elijah in St. Nicholas Church. The second chapel Mozhaiskogo Church of St. George - a researcher associated with the name of Yuri Dmitrievich Zvenigorod, older brother Andrei Mozhaisk, allowing, however, the device of the chapel and at a later time305. - fourth, the device of St. George chapel in honor of his brother Prince-churchwarden it would theoretically be possible in case, if the brother was co-ruler (for example, Ivan Kalita Yuri Danilovich). But Yuri Dmitrievich had its inheritance - Zvenigorod, and his relations with Andrei Mozhaisk were not so close because in 1425, during the turmoil that arose after the death of Grand Prince Vasily Dmitrievich, Andrey headed the army sent Vasily against Yuri306. Kavelmaher, conducted together with You in 1979-1981 excavations in Staro-Nikolsky Cathedral, on the basis of similarity of the details of an ornament of early Moscow and Mozhaisk temples dated latest middle of the XIV century307. In the Lapidarium of the Moscow Kremlin stored fragments of two different ornamental belts - one traditionally belongs to the Cathedral of our Saviour on the Bor308 (in Fig. 56 pictured left), the second - to the Cathedral of the Chudov monastery (Fig. 56 - right). This attribution is indicative only, and Dating Nikolskaya Church in Mozhaisk the middle of the XIV century on its basis in any case, is too vague - something between 1330 year (the date of the Cathedral of our Saviour on the Bor) and 1365 year (the date of the Cathedral of the Chudov monastery). In paragraph 6 of the main 1 we showed that the Church of the Annunciation was built later - in 1390-ies, but regardless of the date of this temple we have to state that no data to correlate with St. Nicholas Church in Mozhaisk we do not. The presence of both temples basement is not the reason for the rapprochement of their Dating as plans, the design and features of the masonry substructure completely different. And stored in the Lapidarium of the Moscow Kremlin fragments of the ornament can with equal probability to belong to the Church of Annunciation and the Cathedral of the Chudov monastery and the Cathedral of our Saviour on the Bor and to any other Kremlin Church of the first third of the XIV century. Ornament similar Mozhaisky (though "inverted"), we see even at the Trinity Cathedral of the Trinity Lavra of St. Sergius310. Therefore, the time range for the Dating of Mozhaisk ornament "by analogy" in any case is too large - since the beginning of the fourteenth to the early XV century, and this confirms our position on the illegality of the use of similarity well-treated parts as self-sufficient argument of Dating. И прежде всего мы обратим внимание на сходство Никольской церкви в Можайске и церкви Рождества Богородицы в Городне (см. гл. 3). Appendix 1 shows the proportions of these churches. They are very close. Close and the size of the temples - Mozhaisk Church more gorodenskoy only 10-15%. Both temples - four-column apses on substructure, with conical transitions from the arches to the drums (in the architecture of North-Eastern Russia similar transition, we see only in St. Nicholas Church in the village of Kamenka). And in Mozhaisk, and Gorodnya reel - big pedestals with specific internal ledges, points which need to serve as platforms for archers (see item 6 2 main). In both churches basement reinforced by additional partitions. The difference in the number of Windows in drums is not the determining factor: in the Church of the Nativity of the virgin and the Holy Trinity Cathedral in drums for 10 Windows, in the temples of Mozhaisk, Kamensky and Zvenigorod - 8. No system, as we see here, that is this factor was associated with the individual requirements of the founders and architects. As we noted in paragraph 8 of the main 1, the same applies to the form of portals, archivolt zakomaras and other well-treated parts. Now look at what we know about the wall masonry Nikolskaya Church in Mozhaisk. 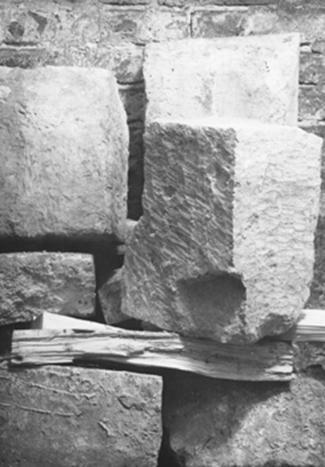 First, a fragment of the ancient half-rubble masonry preserved in the basement (Fig. 50). This "semifinished" processed white-stone blocks an average size of 30 x 40 cm. The author had the opportunity to read this clutch and may with certainty say, blocks, and similar in size, and on the method of processing, built the Church of the Nativity of the virgin in Gorodnya, St. Nicholas Church in the village of Kamenka and the assumption Cathedral in Moscow. Fig. 50. Basement Staro-Nikolsky Cathedral. Fragment of a laying of the XIV century. Move on to the archaeological data. Excavations Kavelmahera and AA Molchanov shown that in 1849 some blocks that had been constructed the old temple was laid in trenches within and outside of the foundations of the new Cathedral. All the researchers found 68 front facades and interior 33311. The photographs shown in the report Kavelmahera and Have (Fig. 51), we see the%312. Fig. 51. The stones from the excavations Kavelmahera and Have in Mozhaisk. The presence of several excavations well-treated blocks due to the fact that in the XVII-XVIII centuries numerous cliffs313 production is314. О том, что в конце XVIII века собор был «сооружен весь из одного белого камня», говорили многие путешественники315. If the majority of chinock conducted not stone, and brick, the temple is unlikely to look like full stone. In a magazine article published in 1841, quoted by N.N. Voronin, semantic emphasis on the fact that the Church was remarkable that scladina was all white stone; after the French (i.e. after the war of 1812 - approx. Voronin), it was corrected and amended used the brick"316.
the%9317 - unlikely to be talking about the temple, built of well-treated blocks. For example, in the middle of the XIX century Dobrokhotov wrote about the monastery fence in Bogolyubovo that it is "built on the site of an ancient, where the Foundation stones of white, wild and cobblestone (my italics - SZ) can be seen to this day"318. According to the results of the excavations Kavelmahera and Ana, the average size of stones related to the temple of the XIV century around 30 x 40 cm. The researchers noted that the installation of many blocks of required gravel319. Consequently, here we see a complete analogue of masonry churches in Gorodnya, Kamenskoye and Settlement. Archaeological research of the Mozhaisk temple also showed that "the decoration of the Cathedral, in contrast to an ordinary masonry block, was perfected"320. The same thing took place in the temples Gorodnya, Kamensky and Settlement. And everything said in this paragraph about the features of the architectural design, construction, decoration and construction equipment allows us justly be considered the St. Nicholas Church in Mozhaisk, the Church of the Nativity of the virgin in Gorodnya and Nicholas Church in Kamenskoye to one construction period. 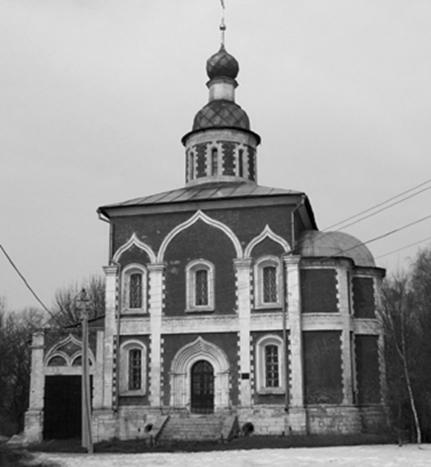 Thus, St. Nicholas Church in Mozhaisk was built not later than the first third of the XIV century. Никольская церковь имеет очень высокий подклет (шелыги арок расположены на высоте около 3,2 м), and this fact allows us to assume that this basement was the first Mozhaisk temple, built immediately after the accession of Mozhaysk to Moscow, i.e. already in 1304-1305 years (like we assumed in respect of the lower Church in Gorodnya - see item 7 main 3). And "cave" this temple was not the basis of his drum could be located at a height of about 4,5 м, i.e. the building was significantly higher than the lower temple of the Church of the Nativity of the virgin. This, of course, only a hypothesis, but it is another confirmation. If the temple was set on the basement, without waiting shrinkage last, near the parish Church in the state of emergency was practically assured (we saw it on the example of the Church of the Annunciation in Moscow - see item 6 main 1). A high and a large Church of St. Nicholas in Mozhaisk stood on a high basement for more than five hundred years. Hence, the time interval between the building basement and the main Church was big enough, and we can talk about just two of Mozhaisk temples - the upper and the lower. In concluding the Mozhaiskogo temple, we can with certainty say that the pedestal under his drum originally ended with innovative features. The predicted A.I. Nekrasov, in terms of the three zones zakomaras321. Kavelmaher and Molchanov found during excavations archivolt shelf width 11.5 cm , and noted in this regard as follows: "For the architect is%B322. We are given what is said in paragraph 8 of the main 3 at the top of the Church in Gorodnya, we can assume that the size and deflection found shelves archivolt (something between a portal and zakomaras) suggests that this regiment archivolt kokoshnik. 16. The Church of Archangel Michael (the Archangel Cathedral in Moscow. 1333. And all the temples that we can have even the most approximate reasoning, built in a specific technique of semifinished "processing of white stone masonry with separate well-treated parts. The forms of these parts are different, but these differences do not go beyond the individual artists and the specific requirements of the donor. Proceeding from the specific features inherent in this particular era, call it the era of "ambitious economy. Clarify our language. We have already mentioned in paragraph 11 of the main 2, that the Moscow Principality ruled by austerity that led to the fact that in the capital of the stone Cathedral of the assumption was built many years after the strategically important stone churches in the border fortresses - Mozhaisk, Settlement and Kamensky. Apparently, it is this savings Yuri and Ivan Danilovich accumulate enough funds to "outbid" Tartar Khan and adopt as a princely table Moscow. But Tver, apparently, was not much richer - otherwise she would not released in 1318 from the hands of "Grand label. Note that Yuri Danilovich was a nephew of the murdered at the Horde Michael Yaroslavich of Tver324 - and khans also took into account the "ladder", giving "labels". So, Khan received from Yuri Danilovich a lot of money - such as never was able to pay Tver. Thus, funds for stone construction in Moscow and in Tver, and even more so in the Rostov and Ryazan princes were catastrophically low. And smooth cutting of stone was one of the most challenging components of construction works. In accordance with calculations complexity erection of the Church of the Intercession on the Nerl made by N.N. Voronin, breaking white is%B325. Consequently, the savings on the "net" of stone treatment for the white-stone building of the end of the XIII century to the first third of the XIV century has absolutely logical justification. But why do we call this era of "ambitious"? Because, despite the need for strict cost savings, the building was built of white stone, and not much cheaper techniques - "opus mixtum" (mixed) - Rev.326. Apparently, this limestone belongs to the upper part of the Carboniferous system, i.e. it is more "young"than Myachkovo. But it is still a stone, demanding labor-intensive production and treatment. Even more cumbersome was his delivery to the construction site - the distance to the Rostov from nearby quarries in the area of the carpet, where yields were low-quality stone327, %250 km (по водному пути). Average white stone building of the end of the XIII century to the first third of the XIV century in any technique (rubble with a lining of low-quality limestone or a half-rubble using myachkovsky white stone) was twice as expensive as similar brick building (the calculation is given in Appendix 2). Even the construction of churches in Kamenskoye, in Mozhaisk and on Settlement (where quarries are located so close that we can neglect the transport component) were somewhat more expensive than a brick building (see item 8 of Annex 2). Note that the complexity of the pre-Mongol Vladimir-Suzdal in the construction of "smooth" white technique was exceeded labor brick in 10 times328. But in Western Europe, construction material, expressing the state power and indologie, in the X-XIV centuries was the stone, and in the middle of XII century in Suzdal transition from the Monomach brick technology to a much more expensive white-stone construction has occurred under the influence of the "Holy Roman Empire"329. Once after the invasion of Batu "ulus" Horde, Russia ceased to be considered European courts as an equal partner330 that could not arrange the great princes - direct descendants of these monarchs world scale, as Jaroslav Mudry Vsevolod Yaroslavich and Vladimir Monomakh. Byzantium after the defeat in 1204 not constitute any meaningful power in the political arena (for example, in 1371 Emperor John Paleologos, was arrested in France for non-payment of personal debts Venetian merchant%331). Значит, все надежды на возвращение Руси в «мировое цивилизованное сообщество» были связаны только с Западной Европой. 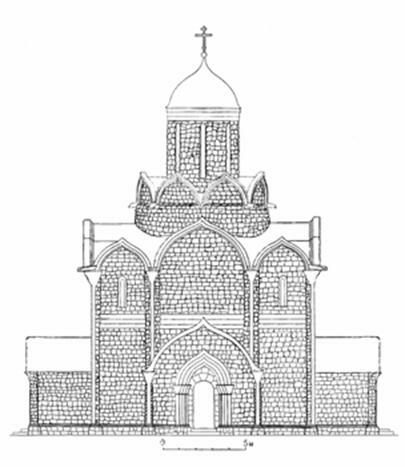 White stone churches were one of the most important elements of the state ideology of Vladimir-Suzdal Principality in the Yuri Dolgorukiy and his immediate descendants332, and in XIII-XIV centuries refusal from Romanesque-Gothic machinery construction would mean the final "loss of face" before the "Holy Roman Empire" and other European States333. Рис. 52. Стена северного нефа собора в Шпейере (Шпайере), XI век. Fig. 53. 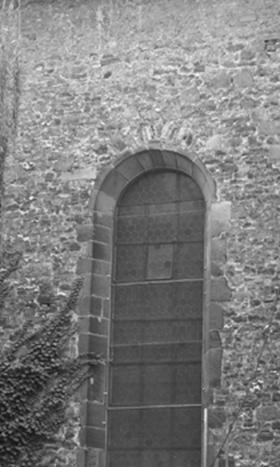 North wall and the window of the Dominican Abbey in worms (XI-XIII centuries). Fig. 54. 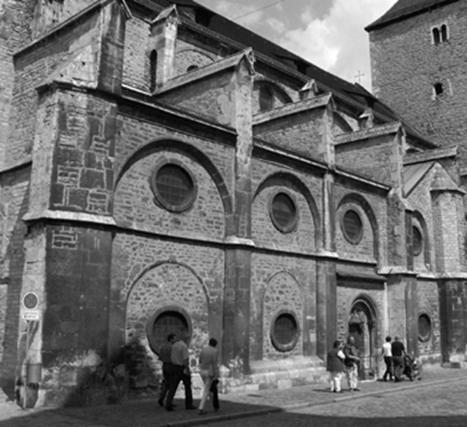 The Church of St. Ulrich in Regensburg (XIII century). And many Western counterparts suggest that in the rough masonry was nothing shameful and harmful to the ambitions of Russian princes. For the early post-Mongolian architecture of North-Eastern Russia, it was just the architectural style is much more economical than the "licked" pre-Mongol, but it is an appropriate rough taste of his cruel time. In this regard, we note the unlikelihood that the churches of this period were plastered on the outside (inside, most likely, the plaster was - otherwise it would be impossible to paint the walls and vaults). If we are talking about the "rubble" period (in particular, the Church of Boris and Gleb 1287), in the case of external plastering lost sense wall covering slabs of limestone. 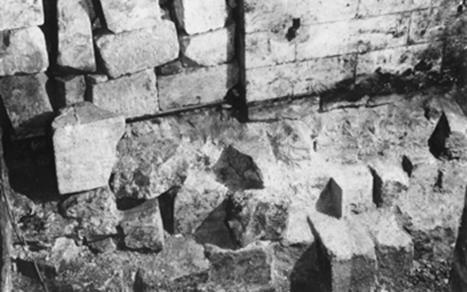 In later period ("semifinished" processed the half-rubble masonry) in this case, lost the sense of self building of white stone: it is much easier and cheaper it would be built of plinfy or technology "opus mixtum"and then plaster (at least, to wash). A white stone - more expensive, but the "European" material is hardly concealed under plaster or whitewash. However, this situation (whitewash as the only available method of conservation of the white-stone masonry churches)seems to be widespread: regular whitewashing exposed Trinity Cathedral of the Trinity-Sergius Lavra, and in the summer of 2003 was very thick whitewashed Transfiguration Cathedral of Pereslavl-Zalessky. Our study would be incomplete if we did not touch the question of the craftsmen who built at the end of the XIII century to the first third of the XIV century temples of North-Eastern Russia. Were there any wizard only local? Or still have Rostov, Ryazan, Tver and Moscow princes worked "alien" architects, and even "errant" building the farm? Just say that the question of the parish where a master may be relevant only in the 1285-1287 years, when for the first time since the invasion of Batu began construction of a stone. In the future we see a progressive and stable improvement of construction equipment: the Church of Boris and Gleb in Rostov - bottom temples in Gorodnya and Mozhaisk - Church on the site of ancient Settlement - the Church in Kamensk - top temples in Gorodnya and Mozhaisk - Moscow churches of Ivan Kalita. Therefore, the architects and the most skilled masters traveled (voluntarily or involuntarily, under his name or under the guise of a wandering monks) on various principalities of North-Eastern Russia, built temples, exchanged experience with colleagues, - in General, there was the usual process of formation of the architectural style. Note that the style of the "ambitious economy differs significantly from the Pskov and Novgorod. Apparently, there was felt to the Imperial ambitions of the princes of the North-Eastern Russia, which did not allow him to deviate from the pre-Mongol building machinery Vladimir-Suzdal Principality in the direction of economical, practical, but the "merchant" architecture of North-C Is%B357 бутовая церковь Бориса и Глеба была облицована белокаменными плитами, т.е. ее внешний вид мало отличался от более поздних полубутовых храмов Москвы и Твери. In this regard, based on the General principles of pre-emptive use of local building workers336we will put under question the alleged M. ioannisyanom and his colleagues337 the parish in 1285-1287 years in North-Eastern Rus craftsmen from Pskov. Hardly Pskov masters would brick Church of Boris and Gleb white stone is a kind of "extravagance" for North-West Russia absolutely very unusual. And if to assume, that the people of Pskov was on assignment of the Prince - to build a "European", - then this task can perform and local masters, in General familiar with the Pskov construction equipment and enriched its unique technique - thin white stone facing rubble to achieve "polubutovaya" appearance at significantly lower cost. A master in all major cities of North-Eastern Russia in 1280-ies were, and we are entitled to assert with considerable confidence, because we have a series Chronicles the repair of temples in the middle of XIII century338. Coming masters of the hostile principalities, Lithuania, Galich and Volyn - in any case is unlikely: the borders were protected, and the transition to the enemy such securities "goods", as the wizard339, was ruthlessly suppressed340. It is also unlikely the coming masters of South Slavic countries - Bulgaria, Macedonia or Serbia. It was, in principle, possible with Dmitry Donskoy341 but in the end of XIII-XIV century, the situation in Russia was so unstable that the master would accept the invitation only at very high cost. But the era of "ambitious economy is not allowed to spend on the construction of significant additional funds. Besides the direct road Balkan masters to Russia was blocked by hostile States - Poland and Lithuania, and "a round about way" - seas in Novgorod - was by the standards of the XIII-XIV centuries very long and cost too much. Masters and South Slavic principalities, and from the North-Eastern Russia could even go to study in Western Europe344 (direct path from Moscow and Tver in Europe through Novgorod and the North German city never stopped). Also - through Western Europe could happen and exchange of experience between the North-Eastern Russia, and the Balkans. 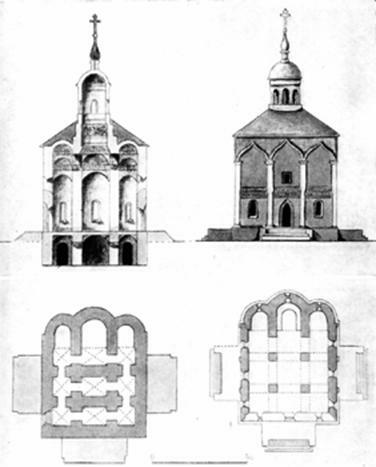 In any case, whatever the ratio of local and "alien" construction personnel, however, exchanges of experience between architects different cities and principalities, still in North West Russia the end of the XIII century to the first third of the XIV century we see a normal, natural process of forming a unique architectural style. Voronin noted that even with the "pre-revolutionary times" there is a stereotypical view of the history of Russian architecture of that time as a time of deep depression and regression caused by the Mongol defeat345. But, clearly proving the illegality of such a stereotype, researchers have proposed as an alternate version of "growing pains"346in fact recognized the same decline of architecture, only "progressive". But in fact, it is hardly possible to speak about the decline, and especially about the "barbarism"347 early post-Mongolian architecture Rostov, Tver, Ryazan and Moscow. Conscious savings (not only money but also time) and decline - is not the same thing. Otherwise Russian masters of the end of the XIII century to the first third of the XIV century forgotten how to do and well-treated portals, and thin archivolt, and ornamental belts. We have no reason to talk about "rudeness" plastic post-Mongol sculptural decoration compared to the pre-Mongol. The comparative analysis made by the author of this book in respect of the ornament on the walls of St. George's Cathedral in Yuryev-Polish and fragments of ornaments of early Moscow temples stored in the Lapidarium of the Moscow Kremlin, showed no significant difference in the "details" of their execution. All dimensions are key elements of these ornaments are very close (Fig. 56). Post-Mongol decor made more economically from a quantitative point of view, but the quality of its Teskey, not lower, and even higher than the pre-Mongolian counterparts. Note that the plastic post-Mongol of the ornament is already closer to the Renaissance than to the Gothic. Fig. 55. 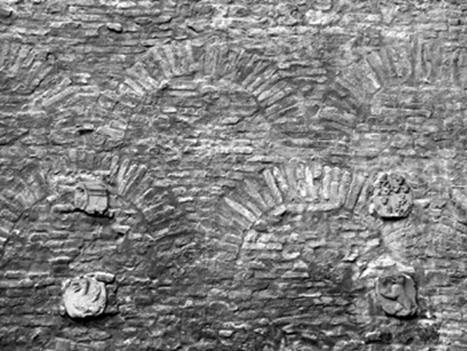 Single plate with zoomorphic reliefs on the wall of the southern nave of the Cathedral in Speyer. You cannot see any "rude" and reliefs of "Gorodische" Church in Kolomna (Fig. 14). Zoomorphic images on it executed very fast, muscles of the animal depicted is magnificent, with a deep knowledge of anatomy. Interlinked through the bending of the back, chest, abdomen, neck, tail creates the impression of integrity of plastic ideas and compositions. In paragraph 4 of the main 1 we have already quoted the pre-Mongolian counterparts of this image (Fig. 16, 17 and 18) and I can confidently say, Kolomna bas-relief of the beginning of the XIV century, made no less, and perhaps more professionally. We can not talk about "poverty" zoomorphic decoration "Gorodische" of the Church: for example, at the Imperial Cathedral of Speyer (this is a traditional writing; more modern - Speyer) very few zoomorphic reliefs are totally haphazard and fragmented (Fig. 55). N.N. Voronin wrote that "such an original design reported the impression of height internal space of temples"348. If this solution was applied in Russia more generally, this "aesthetic" motivation would be acceptable. But in this case the preferred sees another explanation. But, on the other hand, the architects understood that the use of inexperienced construction personnel need increased margin temples, and the overlap large dome spaces did white drums too heavy349. Not a sign of "degenerate" artists and disappearance in the post-Mongolian time with the temples of North-Eastern Russia zooantropomorfnogo sculptural decoration. As is known, the highest point of the pre-Mongol zooantropomorfnogo sculptural decoration was St. George's Cathedral in Yuryev-Polsky. Based on our Dating "Gorodische" Church in Kolomna the beginning of XIV century we can say that in one form or another zooantropomorfnogo type in the end of XIII-XIV century temples of North-Eastern Russia was still present. Perhaps today cannot be regarded as fully proven that the Moscow Cathedral of the assumption 1326-1327 years was only the ornamental decoration type. But four years later was built the Church of the Saviour on the Bor, and there was an ornamental decoration with much more likely351. In the future we zooantropomorfnogo decor anywhere on the temples not meet until the time of Ivan III, when the Spassky gate of the Kremlin in 1464 was put carved statue of St. George352 that, however, can only very tentatively called "zooantropomorfnym decor". To such decoration may not be assigned and a few carved crucifixion of late XIV-early XV centuries353. And about the famous statue of St. Nicholas do not know whether she was in the XIV-XV centuries installed in any temple354. As we saw in paragraph 6 of this Chapter, Batu invasion was not enough to "hard" engineering post-Mongol sculptural decoration compared to the pre-Mongol. We failed to see any "rude" or on the bas-relief of the "Gorodische" Church in Kolomna, or on fragments of ornamental decoration of churches in Moscow beginning of XIV century. The political side of the issue we discussed in paragraph 4 of this Chapter and saw the cultural orientation of Russia in Europe after the Mongol invasion not only weak, but has become even more relevant than in the middle of the XII century, when Andrei Bogolyubsky under the direct influence of the "Holy Roman Empire" in the North-Eastern Russia appeared zooantropomorfny decor356. In XIV century in Western Europe there has been an unprecedented flowering of Gothic decor. Temples with Gothic architectural elements at this time built in Russia with the highest development of Russian "dostanova" Gothic reached in the Trinity-Sergius and Spaso-Andronikov monasteries357 - consequently, to the Byzantine architectural forms and brick construction equipment not tried to return even the Orthodox Church. But the Western European Romanesque-Gothic decor, which we saw in the pre-Mongol Vladimir-Suzdal churches have disappeared. Assuming that there was any objective reasons for its disappearance (General laws of cultural development, the change of artistic taste), then fully and universally gap in such a short period 1310-1320-s - zooantropomorfnogo decor could not. In other words, in the beginning of XIV century in the North-Eastern Russia could be a ban on zooantropomorfny decor. Let's try to understand why. But in the XIV century Church already existed about one thousand three hundred years. If to count from V century, when it became a closed hierarchical system with an established base of dogmatic and regimented rituals, it would be about nine years is a too short period. 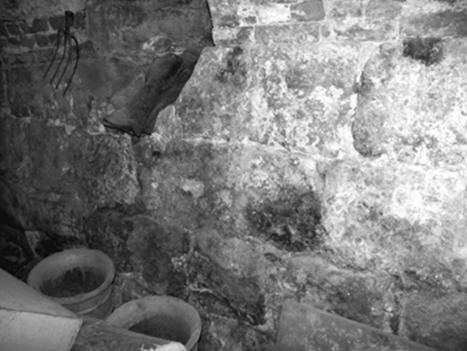 And if in III-IV centuries service could happen in any buildings (including the catacombs), XIV %D358 чем, например, форма и цвет священнических облачений. And to investigate the disappearance decoration of temples zooantropomorfnogo North-Eastern Russia in the first third of the XIV century it is very important that the mere presence of such decoration of the temple is beyond the scope of simple architectural ornaments and ventures into the realm of Church dogma, and in the centuries-old "stumbling block", the Second Holy commandment: "do Not make yourself any graven image that is in heaven above, or that is in the earth beneath, or that is in the water under the earth. Do not worship them and do not serve them..." (ex. 20:4). Probably not worth it to consider in detail the history of iconoclasm - these issues have received more than adequate coverage in the literature, including in theological studies of the author of this book359. For us it is important that even after the victory of the veneration of icons, "legalized" the Seventh Ecumenical Council in 787, the West and the East (specifically, the Pope of Rome and the Byzantine patriarchs) on a number of issues of the veneration of images of one mind not reached, moreover, these differences have become one of the basic elements began in the eighth century centuries-old process of separation of the Church,% D,360. "Ekonomicheskii" the Council in 787 was held in Nicaea during the actual breakup of Rome and Constantinople, and it turned out that the Cathedral was attended by only two of the papal legate, and their legitimacy in %D361. In 794 Charlemagne convened in Frankfurt, its Cathedral, which defined a neutral attitude to any of the images362. But the image image strife. No wonder in the Byzantine VIII century movement called "iconoclastic" - all the wrath of the iconoclasts was directed against icons, and stable tradition of the sculptural decoration of temples on the East never had. And so it happened that in the "ekonomicheskom" the decree of the Seventh Ecumenical Council363 remaining "gap" - sculptural images. Consequently, the General anathematisation "iconoclastic" cathedrals, based on the Second Holy commandments, for sculptures were never revoked. In any case, the "universal". In addition to the aggravation of iconoclasm problems of compliance with the Second commandment of the Holy questions of admissibility of the sculptural image (as icons) do not put365. В принципе, мы очень мало знаем о византийских фасадах и, следовательно, на них могли находиться и резные иконы368. But all the same applies to the carved icons zooantropomorfnomu decor is hardly possible. And in any case it is safe to say that the vast majority of Byzantine carved decorations do not belong to the Romanesque-Gothic style, which we see in the churches of Western Europe, and the pre-Mongol Vladimir-Suzdal land. Note that the Cathedral of St. Mark's in Venice with rich sculptural decoration was built by Greek masters369and it shows that in most of Byzantium the absence of such decoration was not due to lack of masters, and Church tradition. The history of the Russian Orthodox Church knows the times and the heyday of the temple sculptures, and the prohibition of "idol". For example, the Big Moscow Cathedral 1666 decided that the temples carved can only be crucified370. In 1722 the Synod forbade "to have icons in the churches carved and izdolblennye, sculptured" and ordered "weights to the images and any smithy not append". 371. And in the Catholic countries of the West, as we know, sculptures never disappeared, although voting against him were heard not only during the reformation, but in the Middle ages. For example, Bernard of Clairvaux in 1124 wrote: "What makes funny monsters in the galleries, before the eyes of the brothers engaged in reading?.. Here you can see several bodies with one head or multiple heads on one body. Here you can see the four-legged monster with tail like a snake, there is depicted a fish with the head of a four-legged. You can see the animal in front resembling a horse, and behind - the goat, and horned animals, back which resembles a horse. In short, from all parties of such diversity and richness that fun to study the whole day this motley world of sculpture, than to think of God's commandments"372. All of the above determined the complexity and uniqueness of the situation with the prohibition of the sculptural decoration of temples zooantropomorfnogo North-Eastern Russia in the beginning of XIV century. And in Moscow in 1325 to "good and pious" (in the words Yesenberlina373) Ivan Danilovich moved his chair Metropolitan Peter. А старший брат Калиты, по словам Н.М.Карамзина, «по качествам черной души своей заслуживал всеобщую ненависть, и едва утвердясь на престоле наследственном, гнусным делом изъявил презрение к святейшим законам человечества»376 - we are talking about the execution of Constantine Ryazan. Later Yury Danilovich has repeatedly led to Russia Tatars, ruined the whole Principality377, succeeded in intrigues at the court of the Khan Uzbek378 initiated and participated in the murder of the Horde in 1318, his main rival, Michael Yaroslavich of Tver379. The latter soon received from the Orthodox Church the title of St. Martyr. So was his undoing Yuri Danilovich Church, in theory, should have been cursing par with Svyatopolk the accursed. But Metropolitan Peter, in 1313 who had gone to the future of St. Michael Martyr in the Horde, in the early twenties he moved to his murderer. - fifth, is the provision metropolitans of "most favored nation" and the absence of any attempt of pressure on the Church384. - sixth, this plot is%385. - seventh (most importantly for our study), a ban on "Catholic" zooantropomorfny decor. It is unlikely that Metropolitan Peter, being from the "Europeanized" Galician-Volyn land, has been an outspoken opponent of the Romanesque-Gothic zooantropomorfnogo sculptural decoration. But either he or Theognost could directly or indirectly Express displeasure about the "besaste" on the walls of the pre-Mongolian Vladimir-Suzdal churches, and Danilovic, of course, did not dare to play such a decoration in Moscow. Too much in the Prince's policy depended on, which will be appointed by all the Russian bishops, and such "insurance" from the Prince was quite natural. Here as a confirmation of our vision of the situation is an example: ornamental decoration similar to the post-Mongol, we have seen yet on the St. George's Cathedral in Yuryev-Polish at the beginning of the XIII century (Fig. 56). But at the ornaments on the St George's Cathedral was attended by images of people and animals, and so the overall decor of this we refer to zooantropomorfnomu type. And in the 1320's of images of people and animals disappeared, and ornament was to him the Church "dogmatic claims" could not have had. In the beginning of XIV century, as we have seen, zooantropomorfny decor was directly or indirectly are prohibited, but in the 1470's already process was gradual "legalization", in Russia already was brought statue of St. Nicholas387, in the Moscow Kremlin was already installed surround carved icon of St. George. And yet, apparently, was a compromise VD Ermolina with the local Church authorities: the village is%B388, последние согласились на восстановление «исторического облика» собора вместе с «идолами», но «святое» – алтари – отстояли. Concluding the topic of the sculptural decoration of churches, say the following: looking at the heyday of the "Russian Gothic" in the architectural forms of the temples of the XV-XVI centuries (the Trinity Cathedral of St. Sergius and the Andronikov monasteries, hip architecture), you can only surmise what masterpieces of monumental sculpture we lost because of the ban on "European" decor in the beginning of XIV century. But about any "degeneration" masters after the invasion of Batu, neither of which "decline" and "barbarism" of the early post-Mongolian architecture of North-Eastern Russia, we have no right to speak. In connection with all the foregoing, we may assume that the architectural style of the ambitious savings "attitude and Spaso-Preobrazhensky Cathedral in Tver (1285-1290 years). Maybe laying the Cathedral was rubble, and its "polubutovaya appearance was achieved by lining plates of white stone (by analogy with the Borisoglebsk Church in Rostov). It is very likely that the temple %D389. О размерах первого кафедрального собора Твери мы, к сожалению, пока можем лишь строить гипотезы. So, N.N. Voronin on the basis of old descriptions are not extant icons believed that the Savior Cathedral was seven-dome and six pillars390. But the seven - headed Cathedral-an unprecedented phenomenon in the architecture of North-Eastern Russia XII-XV centuries. Most likely, these chapters were represented iconographer arbitrarily. In addition, he is the researcher noted scholar "gilded the top" (i.e. one Chapter) Cathedral in 1399391. Но в Твери в конце XIII века епархия уже была393. The precedent of the construction of the first large diocesan Church in honour of the Transfiguration of our Saviour took place only in 1036 in Chernigov. But, first, we don't have absolute confidence in existence in the beginning of XI century Chernigov diocese, and, secondly, it is unlikely that the Tver could at the dedication of its Cathedral of the throne to follow the example of 250-year-old. And this allows us to suggest the following: in Tver small Savior Cathedral was built as a "temporary Cathedral, and in the near future was supposed to build near big assumption. But these plans have not been implemented: in 1327 Tver was defeated. A similar situation occurred in 1152 in Pereslavl-Zalessky: apparently, the Yuri Dolgoruky built their future capital (as evidenced by the huge ramparts length - 2,5 km) and built relatively small Spaso-Preobrazhenskaya Church near the walls counting on further construction in the city centre, the Cathedral of the assumption. But plans Dolgoruky not realized: he soon went to Kiev and from there had not returned, and Andrey Bogolyubsky arranged capital (and thus raised the assumption Cathedral) not in Pereslavl, and Vladimir. Consequently, we may assume that the Spaso-Preobrazhensky Cathedral in Tver was domed, four pillars and had a very modest size - may, there was even less of the Moscow Uspenie Cathedral 1326-1327 years. The historical fate of the Tver Church confirms that its size does not exceed the "maximum security": only in a hundred years the Cathedral was needed renewing%394. About the first Cathedral of the Moscow Dormition Cathedral, built in 1326-1327 - we already know enough to make an attempt to reconstruct it. Previously such attempt took Voronin (Fig. 57), and its reconstruction was laid as the basis of our (presented in Fig. 58), as the researcher was able to accurately determine the plan of the temple (see item 2 main and 2). There is no basis for the revision of the proposed form of the roof cover the Cathedral. Seen absolutely fair reconstruction N.N. Voronin cap zakomaras and ornamental belts (recall that keeled zakomaras and ornamental belts were present at the St. Nicholas Church in Mozhaisk - see item 2 of this Chapter). Fig. 57. Assumption Cathedral 1326-1327 years in Moscow. Reconstruction Voronin. Fig. 58. Assumption Cathedral 1326-1327 years in Moscow. Reconstruction of the author. 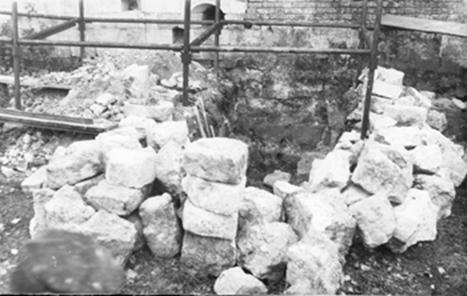 H. Wagner believed that at the assumption Cathedral Kalita could be column-type belt395 but its position researcher was based on the fact that the fragment of such a zone was found in the Cathedral Fioravanti in the "third" use. Of course, to distinguish the "third" use from secondary in some cases it is possible, but the probability of mistakes is very high (especially considering other errors Fedorov and NS shelyapinoy, who carried out excavations in the Kremlin in 1960-1970-s - see item 1 2 main). And the size of fragments found more in line with the huge Cathedral Myshkin and Krivtsov than a small temple Kalita. Therefore, we have no reason to doubt the position Voronin in the availability of the first and second tiers of the assumption Cathedral 1326-1327 years only ornamental belts. What are the main differences between our reconstruction? Schematically played rough white-stone masonry, typical of the era of "ambitious economy, the block Size of which are composed of drum and base, less than rectangular blocks, masonry drum pedestal even less regular than the laying of the quadrangle (as in St. Nicholas Church in the village of Kamenka). Rough and uneven%D396). Cornice, "cutting off" from zakomaras parts of the walls, we do not envisage the reconstruction, because a few below wall already crossed ornamental belts. 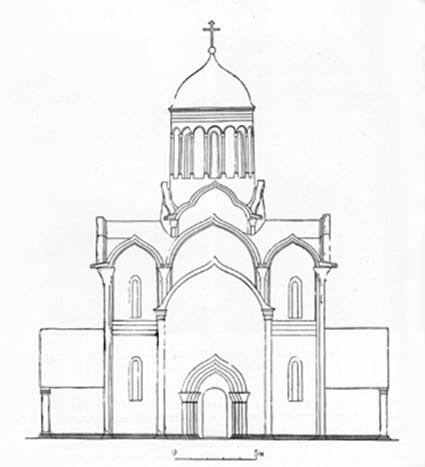 Proportion quadrangular not close to a hypothetical reconstruction of the Cathedral of St. George, Polish, proposed by N.N. Voronin and GK397and to the temples in Mozhaisk and Gorodnya. Compared with the reconstruction Voronin fundamentally changed the top of the assumption Cathedral. We expressly rejected the three-blade front arches on the pedestal under the drum (such arches have no analogues in the North-Eastern Russia) and by analogy with the churches in Mozhaisk and Gorodnya introduced in the reconstruction of keel corbel arches. As in figure A. meyerberg such innovative features were depicted very schematically, the model was adopted by the reconstruction BA Ognev Cathedral of the Savvino-Storozhevsky monastery398. This, the most simple and logical, installation kokoshniki fully corresponds to the high and massive pedestal. "Excesses" in the form of four diagonal small vaults above the Gables (as in the churches abroad of the XIV and XV centuries) we do not enter into reconstruction. The height and the massiveness of the pedestal in combination with relatively small drum connected with the fact that we assume in the assumption Cathedral 1326-1327 years small jagged arches and tapered transition from the arches to the drum (the closest analogues are temples in Mozhaisk and Gorodnya). We believe that large and heavy drums in the assumption Cathedral could not be: Therefore, as we said in paragraph 6 of this Chapter, inexperienced construction personnel to ensure the structural soundness of the temple required lightweight reel with conical transition from the arches. Daylight Cathedral in our reconstruction mostly the top (as in the temples Gorodnya, Kamensky and probably Mozhaisk), although, of course, the placement of Windows in the walls is shown completely relative. As conventional vosmiokonnost drum: it could be deletionism. Arches compared with the reconstruction Voronin significantly lowered: a huge height%2399) Western porch could take place in St. George's Cathedral in Yuryev-Polsky, but for pragmatic post-Mongolian time she is seen as unlikely. We consider it possible to significantly reduce the height of the apses (ornamental belt in the upper part could take place even with belts of the Cathedral). The larger size of the Western porch, compared with the Northern and southern acquitted message Chronicles of the "lesser" the arches400and this situation we, as Voronin recognised in the reconstruction. Based on the results of archaeological research 1960-1970-s (see item 2 in-chief 2), we found it possible in comparison with the reconstruction Voronin improve the podium at 2-3 rows of blocks, and sizes portals, on the contrary, several reduced. In General reconstruction presented in Fig. 58, in our opinion, is consistent and archaeological data, and the architectural style of the "ambitious economy, and traditions of the Orthodox Church, and the basic principles of Western Gothic. Let's hope that future archaeological research in the Moscow Kremlin will help further Refine the design, architectural shapes and decorations of the assumption Cathedral 1326-1327 years, like all other churches of Moscow first third of the XIV century. When the era of "ambitious economy, we still cannot say with reasonable certainty. Of all the temples Kalita we have no%401. So, in theory, after these successful campaigns funds from the Moscow princes were. But could he find it necessary to spend them to the burial vault was built in the pre-Mongol "smooth" technique? If after the construction of these temples Prince continued stone cult building, then, perhaps, we could say that for Ivan Danilovich ramosmania had serious. But, as we saw in paragraph 11 main 2, he built these temples especially in order to gain the necessary "minimum of the Grand. Therefore, it is highly unlikely that at the end of almost continuous construction years 1326-1333 Prince suddenly decided to change the style (and, accordingly, to expend considerable resources to it). An additional argument in favor of this position: octagon John Climacus and the Cathedral of our Saviour on the Bor were built after the defeat of Tver. This means that all construction Kalita years 1326-1333, most likely, was done in the style of "ambitious economy. Then the stone construction in the Moscow Kremlin has been discontinued for more than 30 years (not counting the construction in 1350 of the chapel at the Cathedral of our Saviour on the Bor). What style Cathedral was built in the Chudov monastery (1365), we do not know. The walls of the Moscow Kremlin (1367-1368 years) - the construction of the fortification destination and, accordingly, laying there could be even more brutal than in the churches of the era of "ambitious economy. However, so far we can speak only hypothetically, as there may be arguments for and against (e.g. the%402, а стены Владимирского детинца 1194 года были обработаны «получисто»403). In order to determine the type of a laying of the Cathedral of the Chudov monastery and the Moscow white stone walls, new archaeological data. Then in the Moscow Kremlin not built of stone a quarter-century. Altshuler, performing a dig this temple, wrote: "From the Cathedral of the XIV century, in addition to foundations, partially survived the lower ranks of the half-rubble masonry walls folded on the lime from a fairly well-established white stone blocks"404. Perhaps had in mind those rows of masonry, which opened and excavated Kavelmahera (Fig. 33). In this case, we might say, by the standards of Foundation laying blocks, in fact, treated quite well, but by the standards of wall brickwork - rather rude. More precisely, it is the "semifinished" treatment, which is characteristic for all known temples of the era of "ambitious economy. After another long break stone construction in the Moscow Grand Duchy was resumed in 1390-ies - by Vasily Dmitrievich. About erected at that time, the Church of the Nativity of the virgin (1393) and the Annunciation Church (middle of 1390-s - see item 6 main 1) N.N. Voronin rightly wrote that the clutch had "old Vladimir", although characterized by "less than perfect and more freedom"405. Laying the other churches, built during the reign of Vasily Dmitrievich, processed more smoothly and accurately. Therefore, until we have a new archive and archeological data about the early post-Mongolian architecture of Moscow, Tver, Rostov, Ryazan and other principalities of North-Eastern Russia, we can say that "the era ambitious economy began in 1280 years ended or after 1330's, or after 1360-ies.